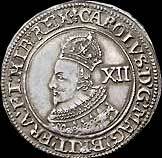 1690 An incredible Irish coin, no corrosion and full lustre. A wonderfull copper plug. A coin struck for Roayl admiration. "In wonderfull preservation and the finest known 30 pounds 1936"
The Gold ,Silver Gun and Copper Crowns were made from origional dies but by Bolton for commemrative pieces to order in the 1800's and made to order & boxed in presentaion case. Please kindly advise if indeed this particular issue was circulated in the U.S. colonies. hi, there has been discussions that IRISH Gunmoney was circulated in the US. I heard that a paper was written a few years ago.